Happy Earth Day! Earth Day is a moment we often use to reflect on the small changes we can make that have a positive impact on environmental health. Whether that’s being more conscious of food waste in the kitchen, bringing reusable produce bags to the grocery store, or cutting down on how much plastic we are using in our lives. The theme for Earth Day 2018 is all about ending plastic pollution. According to Earth Day’s Plastic Pollution Primer, if plastic production and waste management trends continue as they are right now, 13.2 billion tons of plastic will enter landfills or the environment by the year 2050. If that wasn’t startling enough, our oceans are already swimming with plastic waste; an estimated 8 million metric tons entered the ocean in 2010. Plastic not only poses a major threat to environmental health, but contains chemicals such as bisphenol-A and phthalates that have been studied for their negative effects on human health. Being conscious of how much plastic we’re consuming is well worth your time. 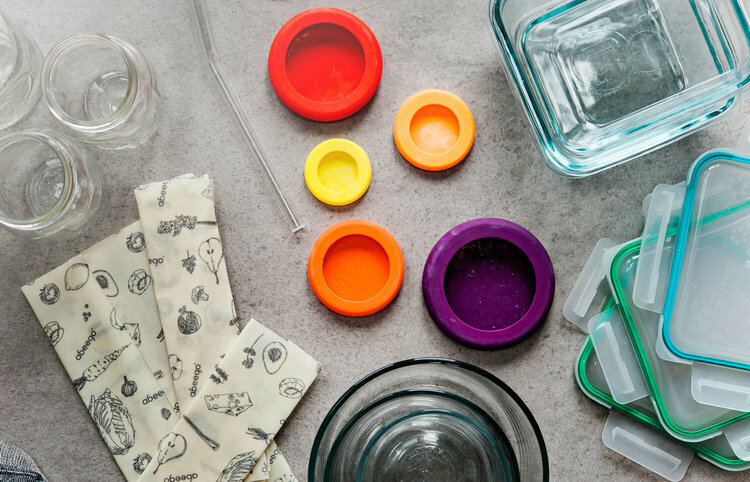 We’ve compiled three easy swaps you can make to cut down on how much plastic you’re using in the kitchen. Single serve plastic straws are a hot button issue right now, with Britain completely banning the sale of plastic straws and urging Canada to follow suit. Locally speaking, Torontonian collectives like Last Straw are calling for restaurants to stop giving plastic straws with their drinks. Last Straw estimates that 57 million plastic straws are used in Canada each day, which are often not recycled. An excellent alternative to plastic straws are reusable glass or metal straws from companies like Strawesome and Keep Cup. Their straws are lightweight, portable, and easy to clean with a small brush. Strawesome even offers a lifetime warranty and will replace your straw if it accidentally breaks. Silicone jar huggers like these ones from Food Huggers are easy to clean and can be used to cover half-empty cans, containers, and half-cut produce. Beeswax wrap like Abeego is a fantastic alternative to plastic wrap. It comes in four different sizes and through human heat becomes malleable enough to seal bowls or wrap produce in the fridge. It can be washed, dried, and reused for up to a year after it’s purchased. Glass food containers, while typically more expensive than plastic ones, are a worthwhile investment. They are microwave and dishwasher safe, great for storing leftovers, and for taking your food on the go. If you’re worried about potential breakage search for tempered glass containers like Wean Green, which are stronger than traditional glass. Not into glass? Stainless steel containers like Lunch Bots are another eco-friendly non-plastic alternative. Mason jars are a popular alternative to plastic due to their versatility and affordability. Large jars can be used for storing batches of soup or bulk items like flours and legumes; while medium and small jars can be used for storing salads, smoothies, dressings, and spices. Let us know what your favourite eco-friendly kitchen products are, or what you’re doing to reduce the amount of plastic in your life. Leave us a comment below, or connect with us on Instagram, Facebook, or Twitter.